We are all paranoid about losing our cryptocurrencies to theft on centralized exchanges. Aren’t we? That fear makes us look for safer and secure cryptocurrency exchanges. Now, we all know that centralized cryptocurrency exchanges are good but not the best when it comes to safety. Moreover, incidents such as Mt. Gox hack and Bitfinex hack imbibe more fear. Despite all, we are forced to use centralized exchanges which fundamentally violate the basic tenants of a decentralized crypto economy. Yes, forced to use because we don’t have many options considering the decentralized cryptocurrency infrastructure and exchanges are still being built. That said, when the decentralized infrastructure is ready in a full-fledged manner, it will breathe a new life into the cryptosphere. People will be able to participate without worrying about the safety of their funds. What more do we crypto enthusiasts need! I have shed some light on why decentralized crypto exchanges will be the future. You can read the full story here: Why Are Decentralized Exchanges The Future Of Cryptocurrencies? In line with that, it becomes pronounced that we start looking for the best-decentralized cryptocurrency exchanges that can be used to trade in today’s day and time. IDEX is a popular decentralized exchange that allows you to trade ERC-20 tokens with ease. It is the best alternative you can get for EtherDelta and is way better and user-friendly than ED. It is also amongst the top decentralized exchanges by volume. You can also use IDEX with MetMask or Ledger Nano S-like wallets to further strengthen your security while using this exchange. The volume at the time of writing on this exchange is 360 BTC which I think is very good for a decentralized exchange. It also has 130 cryptocurrencies/crypto assets listed on it. Note: When you register on IDEX, don’t ever forget to keep your back phrase/password/private keys safe because that is the only thing that will help you restore your funds. 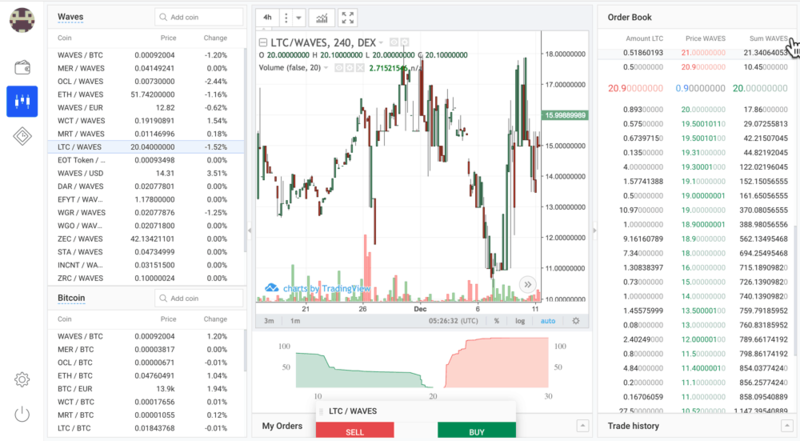 Waves Dex or the Waves decentralized exchange is the product of Waves cryptocurrency and blockchain about which we have talked in detail on CoinSutra. You can read more about it here about it. The Waves exchange provides you with the best of the two worlds by handing you the control of your funds on the blockchain. It also accelerates the exchange process by using a centralized matching service. This way you get the best of both the centralized and decentralized worlds. As mentioned earlier, Waves is a decentralized exchange built on the Waves blockchain. It allows users to trade their BTC/ETH, etc., in exchange for Waves (or any other asset token issued on the Waves platform). The volume at the time of writing on this exchange is 187 BTC which is a decent number for a decentralized exchange with 72 cryptocurrencies/crypto assets listed on it. Note: Keep your back phrase safe because that is the only thing that will help you restore your funds. OpenLedger is a blockchain based company based out of Denmark that provides decentralized solutions for the crypto market. They have a decentralized exchanged known as OpenLedger Dex which leverages BitShare’s graphene technology to cater its services. Opening an account on OpenLedger is quite easy as it doesn’t require any registration or KYC to start with. The only thing you need to take care of is your login password and username because that is the only thing which can help you in case something goes wrong. The volume at the time of writing on this exchange is 320 BTC. 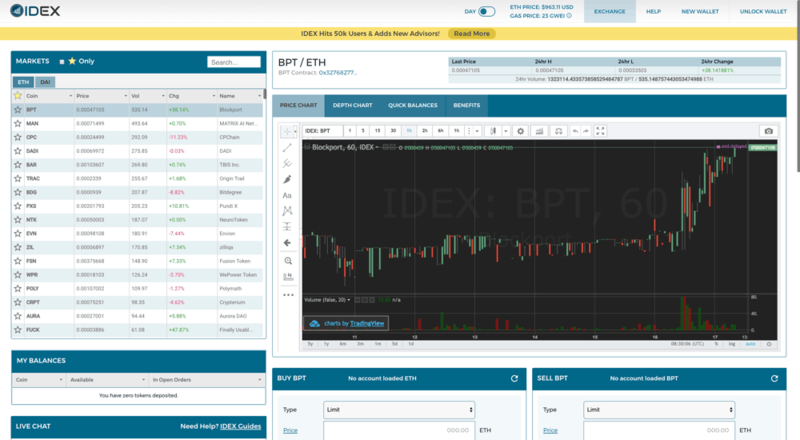 CryptoBridge is a new entry in the decentralized crypto exchange market. It is a decentralized exchange running on top of the BitShares Network. It supports decentralized trading on all popular altcoin pairs without a single point of failure. You always hold the private keys to your funds which means only you have access to them. It has native BCO token called BridgeCoin. It allows BCO token staking and 50% revenue share with BCO HODLers. It has no single point of failure because of its federated servers. The login process is quite simple. You need to select a unique username, and a cryptographic password will be generated automatically. Just note it down and keep it safe. The volume at the time of writing on this exchange is 201 BTC, pretty decent numbers for a decentralized exchange with 38 cryptocurrencies/crypto assets pairs listed on it. OasisDEX is another decentralized exchange by MakerDao that allows you to buy cryptocurrencies. 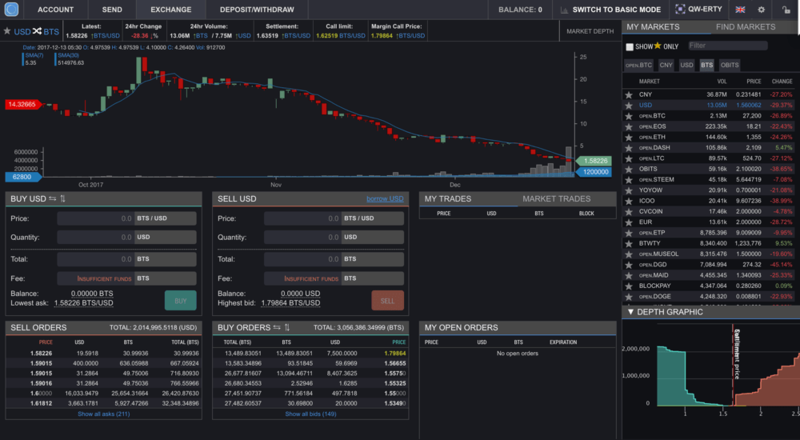 However, considering the exchange is in the alpha testing phase, it is not highly recommended to trade on. But, you will find a good volume on it for 3 cryptocurrency pairs namely ETH/DAI, MKR/ETH, MKR/DAI. To access this exchange, you will need an account on MetMask because it is an Ethereum DApp. The volume at the time of writing on this exchange is 90 BTC. Radar Relay is a decentralized exchange that allows you to trade Ethereum tokens without the interference of any middleman. To use Radar Relay, you will need a MetaMask wallet with ETH cryptocurrency on it to pay for the Gas fees, etc. 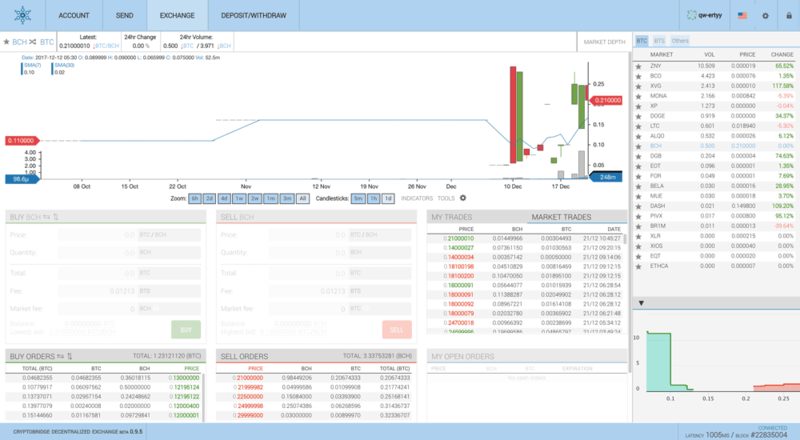 The exchange is in the beta phase currently but has sufficient volume to get your hands dirty. Also, you control your funds and the only thing that you need to take care of while using this exchange is the recovery phrase of your MetMask Wallet. You can also use this exchange with your Ledger Nano S wallet which is a much safer option. The volume at the time of writing on this exchange is 3 BTC with more than 40 cryptocurrencies/crypto assets pairs listed on it. Because it uses the technology of atomic swaps, you can say BarterDex is the most advanced decentralized exchange out there. The UI, however, is not great. Hopefully it will get better with time. 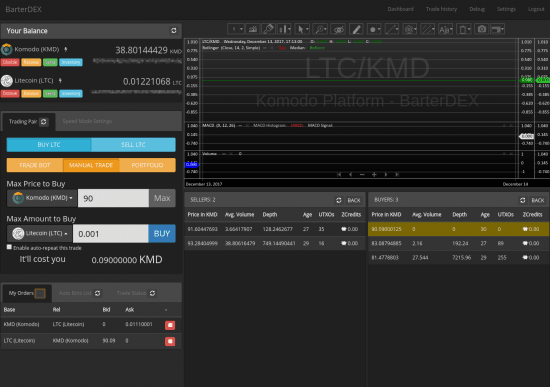 BarterDex, a product of the Komodo platform, recently crossed 60,000 atomic swaps on its exchange! Also, the new version of their GUI wallet which will be available on Windows, Mac, and Linux is under development and is expected to be much faster and user-friendly. But for advanced users, the old GUI version is available on Github here. So if you are a tech nerd, go ahead with your first atomic swap using BarterDex. The volume at the time of writing on this exchange is 2 BTC with more than 80 cryptocurrencies/crypto assets pairs listed on it. Bitsquare is a peer-to-peer marketplace for cryptocurrencies like Bitcoins. It is a fully decentralized exchange which requires no name, email ID or verification. To be a genuinely anonymous peer-to-peer network, it uses Tor and doesn’t hold fiat or bitcoins on their servers or in their account. Every aspect of this exchange, from placing the order, to matching the order, or executing it, is decentralized. 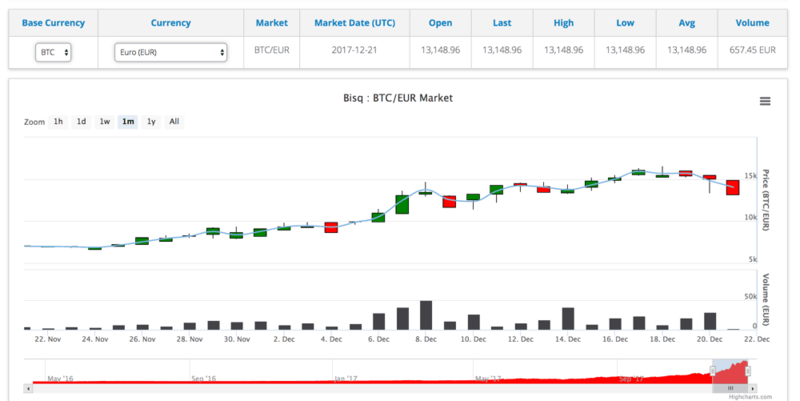 Currently, it supports 126 cryptocurrencies (including BTC) and is available on Windows, Mac, and Linux platforms, but trade volumes are low. How Bitsqaure works is beyond the scope of this article. But in the future, CoinSutra is going to cover all essential aspects of Bitsquare. Note: Bitsquare rebranded to Bisq due to copyright issues. The volume at the time of writing on this exchange is 4 BTC with 11 cryptocurrencies/crypto assets pairs listed on it. We have all heard of Stellar. It is a popular cryptocurrency and blockchain project. The news here is, Stellar has also come up with its decentralized exchange. Public key: The public key is used to identify the account. This public key is used for receiving funds. Secret key: The secret key is used to access your account and make transactions. Keep this code safe and secure. Anyone with this key will be able to access your funds on the Stellar Dex. When you log in to the Dex using this key, you will be shown a public key where you will be required to deposit 20 lumens to activate your account and start trading. The volume at the time of writing on this exchange is 55 BTC with 6 cryptocurrencies/crypto assets pairs listed on it. There are some more decentralized exchanges out there but they are either being built or have very low liquidity or are facing security difficulties. However, irrespective of their current state, the future of decentralized exchanges looks promising. Now it is time to hear from you: Which Dex do you use? Did I miss any major Dex with good liquidity? What do you think about the future of Dex? Let me know your thoughts and comments in the comments section below. Good article. Which of those exchanges allow fiat money to open and account? Which allow sending and receiving fiat money to a non US bank. My bank is in Canada. Bisq and WavesDex should work for you. Once check them out!! So, in waves I could exchange fiat for say TRX without having to first buy BTC then TRX? supposedly, yes, I know Bisq intends 2 do exactly that. But as it is completely decentralized, your trade depends on finding a maker/taker match, preferably in your own country, to utilize bank transfer. No exchanges which don’t have single points of failures can’t be shut-down!! KyberNetwork will provide that functionality in future but still not started. Do you know any new decentralized exchange platform that will be released soon ? A bit like cobinhood which seems pretty promizing. For now Crypto-bridge is the most active decentralise exchange that we can use. There asre few others but they don’t have so much volume. We will post about new DEX as soon as they become worth mentioning. Nice article, did you omit Kyber, Airswap and ZeroX intentionally? That is a triple negative. I think you are trying to say Decentralized exchanges can’t be shut down. No…don’t…can’t – is a triple negative. If I said “I didn’t do nothing”, that would be a double negative and would mean I did something. If I said “I didn’t not do nothing”, that would mean I did nothing. He’s nitpicking a bit much. All you need a comma after no (“No, exchanges”). What are your thoughts on altcoin.io? Altcoin.io is on our radar. looks promising from the beta but not yet in production, should be good DEX. Thanks for the post. Really good info. Before reading this article,I was thinking etherdelta is the most popular Dex. Out of the 5 mentioned Dexs, which one you think gain most popularity and why ? Your explanation certainly helps. Looks like you have done thorough research on this topic and I echo your analysis. Decentralized exchanges have great future. Is these decentralized exchanges offering any coins? Would like to invest in them. I think CryptoBridge is growing very fast, however, it not the best but yeah they pay you for holding their BCO coins. So it is good from that side. BCO coins of CryptoBridge you can buy that if you want. All pros are listed above. Also, When Waves DEX will function properly it will be ahead because of-of its fiat gateways. Insightful post Sudhir. I must confess I only knew about Etherdelta. Quite an “mind” opening article. what about bitshares? seems very promising..
2 of Sudhir’s list are bitshares based exchanges: OpenLedger and CryptoBridge. Good stuff on decentralized exchanges. Is CryptoBridge the only one you are aware of that has a staking and subsequent reward model? It’s an interesting approach for an exchange to take. So far Cryptobridge only allows to stake. why not bitshares in the list ? I like wavesDex. It is lightning fast. The only thing I worry: you Cher BTC, LTC to waves and u actually trade the equivalent waves Token, I.e. once inside waves I don’t have the BTC private key any more. What is your opinion on that? The initial phrase that Waves Dex generates is everything that you need. That’s your new keys in a way. Nice one, thanks! I like IDEX indeed, been using it for quite a while. 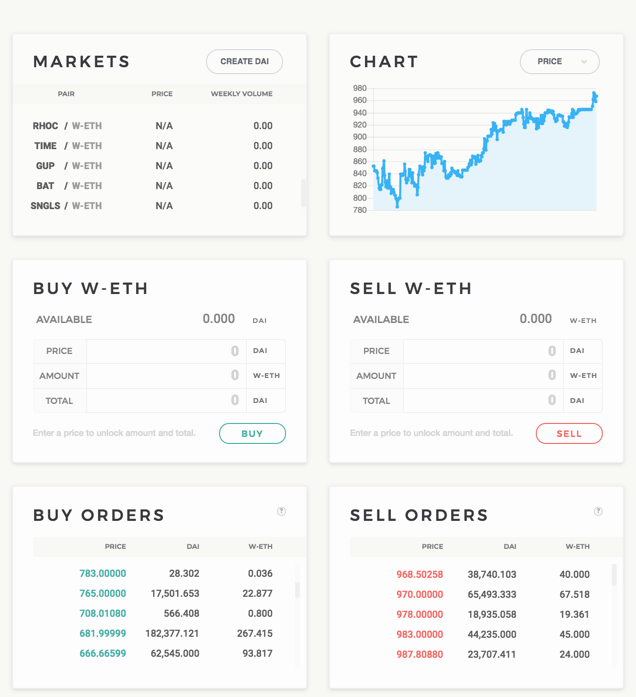 I’ve also stumbled upon this exchange DUBIEX, it looks very slick and user-friendly but on the downside, it doesn’t have much volume right now. The only ERC20 tokens that are being traded there at the moment are PRPS and DUBI which are “shares of exchange” just like binance or kucoin has. Thanks for the info, I didn’t know about DUBIEX, will keep and eye. Great post! I’d like to see a list of platforms these exchanges are built on (with a description), and noting which, if any, exchanges use a decentralized orderbook. What about EtherDelta as the tenth one on this list? Quite skeptical to add it after it got hacked. Do you have any information on the # of users per exchange. I’m concerned the volume could be due to bots. Nope, one cannot get just like that. Excellent article 🙂 From the list I already traded in IDEX. 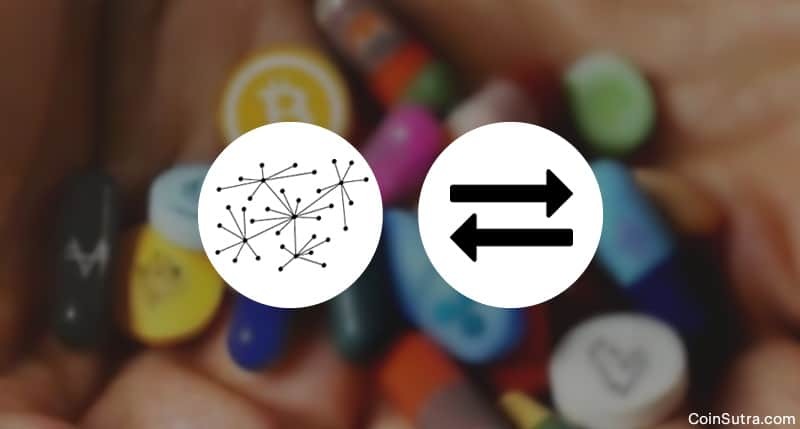 Decentralization is the future! Low volume, so hasn’t looked into it yet. Hi, Thanks for sharing this informative article. I really wonder about whether it is possible to create a fully decentralized cryptocurrency exchange websites, but it becomes possible. Hope in future, there will b e a plenty of decentralized exchange will occupy cryptocurrency marketplace. Why did not Kyber Network make this list? Hey Sudhir. I really enjoyed reading your article. Gave me insight and a urge to learn more. I understand with wrong information i can be lead a unfortunate path. I may be out on a limb but i sense of honesty with you and maybe you can lead me in the right direction to learning more on how to invest in these markets. Bitcoin eos RIPPLE! Thank you any information will be appreciated. I have a ledger nano s. I’m new to crypto and I live in the US. What decentralized exchange can I use to buy Bitcoin? Waves exchange, there you can buy or at Bisq exchange. Both are DEX. You Left out the only real decentralized exchange and order matching service – BlockDX which runs atop of the Blocknet Protocol. Users maintain control of their tokens and private keys 100% of the time during the atomic swap. The Blocknet Protocol supports atomic swaps between any BTC style coin (LTC, DGB, DOGE, etc) and Ethereum. Where is Binance, Bittrex, etc? I haven’t even heard about most of these exchanges. Where is ChanegeNOW – the most convenient? These are Decentralized exchanges. Binance and Bittrex are not yet DEX.